Tein basic or Function form ? So I have actually narrowed it down to Tein Basic or Function Form coilovers? If you have ridden both, tell me which feels more stiff and better overall? I need a stiff suspension so my tires wouldn't rub the fender liners that much. Also, can I use my current top hat to mount the Tein basics onto? Re: Tein basic or Function form ? does f&f type 1 fit 5th gen prelude? i see,do i need camper kit for this coil? depends how low you want to go! I have F&F Type-1 coilovers on my 4th gen. They're nice. The ride is pretty civilized for a coilover. Yes, they're considerably stiffer than stock. Would I say they're stiff though? Not really. For all practical purposes, they're more than enough for aggressive driving or occasional autocross. My only complaint is that the springs in the rear are too soft. If I had to do it again, I would have asked if they could put heavier springs in the rear, but that's just me. Don't get me wrong, I think they're fantastic. Last edited by kai_99lude; 01-11-2012 at 02:05 PM. Mine tucks tread up front, and a little of the sidewall in the rear. The fronts are as low as you can go (without swapping to the stock tophats), and the rears have at least another 1.5" that they can go down. My camber is at like -2.4 degrees. Tire wear hasn't really increased. However, you'll want to get your toe fixed after dropping that low. Mine was way out for about two weeks and it chewed up the insides pretty quick. Since I got that fixed, they've been wearing normally. Last edited by Phantom240; 01-11-2012 at 03:13 PM. Anyone else notice how TEIN reccomends a rebuild after "X" amount of miles? You're better off buying a new set once you reach that point. For the money, go F&F. You could end up spending 3x that amount in TEIN's. If you were planning basics, you'd be better off going super street or flex instead - because you WILL want to upgrade since the basics reuse stock tophats and if intending to go lower won't cut it. to be honest,i know nothing about camber and toe setting if i decide to drop my lude. how does camber and toe work? When you lower the car, your negative camber will increase, meaning the tops of the tires will lean inward, putting more stress on the inside edges of your contact patch. On Preludes, it will also cause negative toe as well, which means the fronts of the tires will angle inward like pointing at one another. This causes the forward movement of the tire to be less like rolling straight, and more like scrubbing the tire across the pavement. This is what REALLY destroys tires quickly. I don't have a camber kit. They're expensive and quite frankly, the little bit of extra negative camber won't have such a great effect on tire wear as most people would like you to think. It's the negative toe that destroys tires quickly. Last edited by Phantom240; 01-11-2012 at 04:56 PM. At more than double the cost, I'll pass. He doesn't know much about camber, caster, toe, etc.... I'm pretty sure he's not building a race car. atleast here teins are more expensive than BC's..
Last edited by TypeT; 01-11-2012 at 07:07 PM. 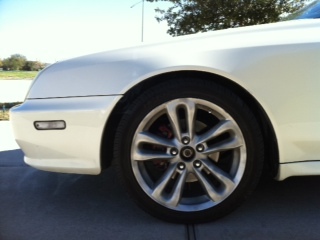 My car is lowered 1.5" - I have 0 camber in the front and -1 in the rear on rims/tires near stock spec. So you could use that for a reference that if you only go 1"-1.5" lower, that's all you should be experiencing - but no way to say that will be the exact case for your specific car/setup. Toe is the angle the wheels are (left to right) aka toe in toe out. Usually you'll see more negative camber on your rear tires when you have alot of weight in the back. Or in this case lowered. Always get an alignment after changing the ride height of a vehicle. yes im not building a race car,planning to keep it as stock as possiple. I DD my 4th gen, if I didn't mention it before. I also have to cross over dilapidated train tracks 10 times a day. Three on the way in to work, three on my way out, and four when I leave for lunch and come back. They're still holding up. To be honest, I don't think it's a fair comparison. The Tein Basics aren't anywhere near as adjustable as the F&Fs, which are IMO a far superior product that you don't have to pay an arm and a leg for because the company doesn't have heritage. Kinda like comparing a Nissan GTR to a Porsche 911. As for ride quality, that's completely separate. Remember that an OEM S2000 is too stiff and jittery for most people to put up with on a daily basis, yet there are others who are quite happy to feel every bump and cigarette paper they drive over through their lower spinal column and buttocks. I have tein on my car now and am upgrading to FnF in the spring, stiffer spring rates, full shock travel and you can go lower.. Idk I had the Teins all last summer and they just aren't stiff enough for me. Good quality coilover though.. Just not fitting my specifications. I am currently running Function & Form Type 2 coilovers and iv had no problems yet. they were easy to install (as most are) but the only bad thing was 1 of the adjustment knobs were broken. They ride clean & flush tho, i have them at 25 out of 32 so its defiantly stiff. 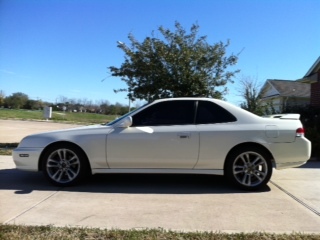 Here's a pic of mine, i have lowered it a little more since the picture but dont have any recent pics. Its not the best angle but the tires defiantly do tuck under the fenders. Last edited by Brianotto93; 01-13-2012 at 11:23 PM. Reason: added 1 more sentence. I thought the lower the damper setting, the stiffer it got... That's how Tein is. This is true. There is a noticeable difference with dampening adjustable coilovers. I ride with my TEIN's on the softest setting typically - and turn it down when I go on my back road joy rides. But from my understandings (someone correct me if i'm wrong) overall the spring rates are very soft. So basically they work harder since the springs are always compressing and decompressing vs other coilovers where the spring rates are stiffer and the dampers don't move as much resulting in a stiffer ride. And TEIN basic's are not damper adjustable. Only Super Street and Flex are. The springs on the F&F coilovers are soft. No, the dampers aren't working harder, it's actually the opposite. Because there is less spring force, the damper has to create less resistance to counter the motion of the spring. In coilovers with heavy spring rates, the damper must work a lot harder to minimize movement from the spring. In coilovers whose dampers are weaker than the spring, you get a lot of bouncing because the damper can't compensate and counteract the spring's force. Imagine a car with blown struts. The damper is doing nothing, so the car just bounces. The spring didn't get softer or harder, just the damping force got weaker. Which is why I thought the softer springs meant the dampers are working harder to compensate for the soft spring rate and less for the stiffer springs since there is less play in the stiffer springs.